Three thousand ducats, or a pound of flesh. Such are the terms of the loan agreement between the borrower, Antonio, and the lender, Shylock. Much of the story and plot is a light romantic comedy as wealthy heiress Portia gets wooed by suitors and tries to help Bassanio become the winner. But it�s the plot about the loan that sets the stage for perhaps William Shakespeare�s most controversial play with its character of Shylock, a Jewish moneylender who chooses revenge over money. This negative stereotype has been perpetuated for a thousand years in Christian culture. For centuries the European governments forbade Christians to charge interest for the lending of money, so only non-Christians could fill that economic need. But when loans couldn�t be repaid, it was easier to blame the minority Jewish moneylender than the Christian. Such blame was a common theme in tales from the time period. Shakespeare�s use of it is more ambiguous than his contemporaries. Shylock stood apart from most other portrayals both in the depth of his character, and in his condemnation of hypocritical Christians who borrowed with one hand while striking blows with the other. 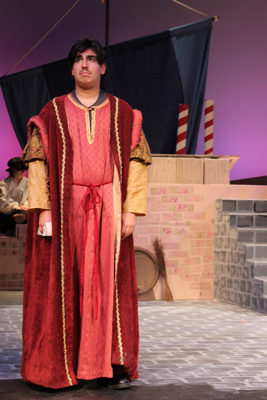 Citrus Valley High School�s Blackhawk Theatre Company staged a remarkably creative, entertaining, and effective production of The Merchant of Venice directed by Ron Milts. It�s performed as a commedia dell�arte, with most everyone but Shylock and his daughter wearing the outrageous masks of the genre and performing in its signature over-the-top comedic style filled with ongoing gags that repeat whenever a certain word is mentioned. Shylock, featuring a terrific performance by Raphael Berglas, plays it straight, growing increasingly frustrated with the insanity that surrounds him. When his daughter elopes, leaving his home and his faith, she dons a mask as well and joins in their insanity, and we feel his desire for vengeance soar uncontrollably. The cast of commedia dell�arte comedians nail the style with professional and natural ease, whether reciting Shakespeare, doing a bit of improv with the audience, performing sound effects, and even some acrobatics. McKenzie Graham-Howard is a great actress and physical comedian who plays Portia as an Elizabethan valley girl confiding in her friend and lady-in-waiting Narisa (a delightful Jacqueline Cooper who ends up pulling countless odd props from out of her dress�s bosom), toying effortlessly with her suitors, and being not quite thrilled when she finally gets her long-awaited romantic kiss from Bassanio � a reluctant kiss on the cheek. Chris Carranza is a hoot as said Bassanio, unstoppably charismatic and ditzy, a little effeminate, and always grinning except when he�s forced to kiss Portia, as his primary motivation was really her money. Just a few of the other great performances include Andre Alvarez as the merchant of Venice who takes out a loan to help Bassanio woo Portia. Ben Swanson gets things going as a bawdy hunchbacked Lancelot Gobo, very funny and kind of creepy, who plays it up to the audience. Brant Sennett as Gratiano and Nick Ferguson as narcissistic Lorenzo give strong performances. Tristyn Deveau is fantastic as Shylock�s daughter who transforms thanks to her being as obsessed with Lorenzo as he is with himself, her elopement beginning as she tosses a few necessaries for the trip over the house�s wall (a giant sandal, a huge bra, a stuffed bunny, etc.). And Noah Ramos and Kaitlyn Lopez as clowns Salanio and Salarino add so much throughout with their antics, all coming together as they physically reenact a speedy reprise of the first act. The entire talented cast makes this work throughout with great energy, comedy, attention to detail, and off-the-cuff humor. And they all look good doing it thanks to impressive visuals by set designers Ron Milts and Jennifer Vincent, and costumes by Sharron Leeper that help take us back in time to one memorable trip to Venice.